The Kiddoodles mug series is the next generation of one of our all time best selling line. 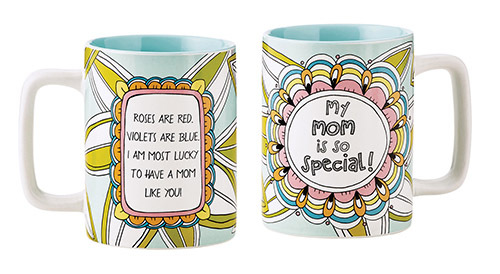 The Mom Is Special mug features eye-catching, youthful art and endearing sentiments that your little ones can add their own personal touches to on the mug and gift box to make a one-of-a-kind gift for someone special. Using an oil-based permanent marker (not included) you can color in the lines and bake the color on. Imprint reads: Roses are red, violets are blue. I am most lucky to have a Mom like you? Sure to become a treasured keepsake for years to come.